At least 31 people have been killed in bombings near a market in eastern Baghdad, Iraqi officials say. The blasts happened at the Shia district of Sadr City and were caused by two suicide bombers. The so-called Islamic State (IS) group says its militants had carried out the attacks and more would follow. The mainly Sunni group, which controls large swathes of northern and western Iraq, has attacked numerous Shia targets in the country recently. 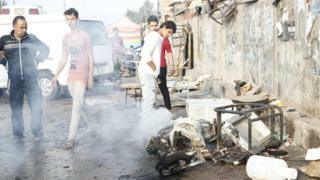 Sunday's blasts, the worst to hit Baghdad in recent months, injured at least 50 other people, Iraqi officials said. Pictures showed pools of blood on the ground with slippers, shoes and mobile phones at the site. Dozens of people have died in attacks claimed by IS in recent months in Iraq. The jihadist group said it would continue to target Shia Muslims, who are considered by them to be heretics. The militants have constantly used double bombings to maximise casualties - a second device is detonated at the site as people flee or emergency services arrive. Earlier on Sunday, IS suicide bombers and gunmen launched an attack on the western suburb of Abu Ghraib, before being driven back. Officials quoted by Reuters news agency said at least 12 members of the security forces and 20 militants were killed in the violence. IS has lost parts of the territory it once controlled in Iraq as the result of an offensive by Iraqi and Kurdish Peshmerga forces backed by US-led coalition strikes. Iraqi officials have said an offensive is being prepared to retake the city of Mosul, the largest controlled by IS in northern Iraq.